I'm interested in rhythm and repetition, and how they can relate to the unfolding of improvisation. For me, repetition is a way to take movement out of time, and make it a space to inhabit. By doing something again and again, we illuminate the whole structure, laying down trails that give shape to the landscape. When working with another person, repetition means that something doesn't have to work right now, there is less sense of "this isn't setup quite right, but I'll go for it anyway'' because we can relax into knowing the possibility will come round again. Repetitive movements let us trace the movement all the way through our bodies and those we are dancing with, feeling the echoes of action echoing through the skeleton. There are points of coordination, of correspondence. There are equilibria, attractors in movement space which we can circle, again and again, until something tips and we roll into the next valley. So my warm-up was about rhythm and repetition. We started from the rhythm of running and walking, seeing how the pulse of motion translates through our bodies, trying to feel it in others, paying attention to breathing and pulse, synchronising and letting go. We found the liquid sloshing of water, settling our bones down to the seafloor to allow oscillations to refract through limbs and torsos. We shared each other's rhythms, moving from listening in with fingertips to finding a deeper connection, allowing our partner's rhythm to move us, then responding from that place of connection. For me this gives a great insight into how others move, gives me the time to sink into it, and find a shared language for dialogue. And we worked towards a building an intermeshing movement machine, with patterns transmitting, mutating, fading out and re-emerging. There's a lot to explore here, and this has been a fantastic way to get started. In the talk after the jam a couple of things came up for me. One was around trying to understand whether people were enjoying the material I was presenting - often when people are really engaged in something, they look serious rather than joyful, and it has been useful to develop the confidence that this is OK, and it doesn't meant that they're bored or disinterested. The other was around what to do when I turn up and I'm not in the mood to facilitate - I'm tired, or grumpy, or I just want to dance! For me, moving more towards *doing* seems to help here, facilitating by action and joining in rather than standing back and transmitting gets me engaged and open and generally more joyful. 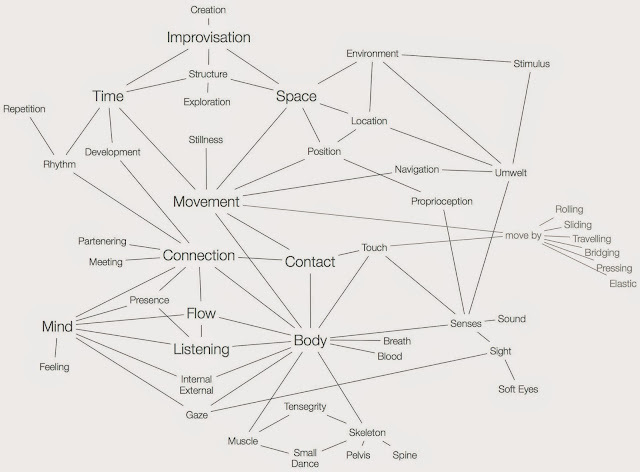 In the last session, we danced the underscore, Nancy Stark Smith's structure for jamming. I find it a strange and wonderful beast, a mixture of structure, practice, advice and tradition. Firstly, there's an overall architecture for a complete jam, starting with arriving energetically, becoming physically ready to begin and meeting to discuss intentions, plant seeds and note any points where care should be taken. From here, there's a route through moving in the space, connecting inside and connecting with the earth, opening up movement pathways into overlapping with other's kinespheres - getting warm, getting focussed, opening up and gradually getting interactive. This leads out into an open score, which then resolves into personal reflection and group sharing. In many ways, this is a familiar structure from many jams, but here it is explicit, mapped out, piece by piece. There are elements which often don't happen - a disconnection and time for individual reflection before sharing, for example - which suit the focussed nature of the practice. For me, the focussing and commitment is one of the strongest parts of the score, the sense of shared journey which is created, bringing intention, starting and finishing together. In the middle, there are a collection of 11 kinds of connection we can have while starting to dance: collisions and tangents, influences and coincidences, touch and attraction. Suddenly, this doesn't feel like a score to me; it feels like defining a form, mapping out a space. I get a sense of "Here are all the things that might happen", rather than "For this piece, we will constrain ourselves to this material". This feels like rich ground for workshops - developing the ability to see, articulate and intend the different ways of interacting, helping to open to some of the more compositional aspects of contact, beyond the immediacy of touch, out into space. Its a place where naming things turns them into tools to be picked up, explored and then integrated back into our practices. 'Grazing' is the start of interactions in the Underscore - moving through the space, tasting different people, different connections, different situtations, to find one to engage with. For me, going in with a grazing mindset opens possibilities of lightness, of integration, of weaving a fabric out of the whole group through a thousand tiny knots rather than falling into tangles as duos and trios. There's an arc to interactions in the underscore: grazing leads to engagement, then development, resolution and finally disengagement. In my underscores, I haven't felt this arc - the structures and the dedication applied to them have led me towards a fluid sense of connection, with the possibility for reconfiguration without losing depth, to submarine from one dance to another. I wonder how to encourage the moments of reflection and re-orientation between dances which come from a clear resolution. And right at the end are a collection of strategies to draw on - finding gaps and choosing how to respond; sending awareness outwards; the wonderful "Idiot Button", to simplfy, return to breath and presence. Again, these feel like tools to deepen practice, but in many ways they're broader than Contace, probably broader than dance. They remind me of Oblique Strategies, Brian Eno and Peter Schmidt's set of cards for encouraging lateral thinking - content free in the best possible way, general tools for working within improvised situations. Overall, I've always had great jams in underscores, but I'm not sure which bits are most important, and as student I want to try to find out. Is it the shared commitment, locking the door and saying it's just us dancing for the next 2 hours, no talking, no phones? Is it taking the time to plant seeds and set intentions at the beginning? Is it the extra long warmup, or the particular structure of the warmup? Or is it all of them together, or that there are different bits which work for different people, and there is enough stuff here to engage everyone? I'm writing this on the train back from the UK Contact Improvisation Teacher's Exchange, full of ideas about how dances, jams, critique, feedback, development and communities work around Contact Improvisation, with a question in the back of my mind about what really CI is, and why people come to it from so many different trajectories. We started the first New Jammers session by connecting as a group, getting a sense of where the others were at. Personal warmups, introductory dances -- CI speed dating. It strikes me that there are two sides to facilitation. There is the infusion of inspiration, guidance and shared states which is the visible side, the exciting, sometimes daunting, but highly present activity of warming up and launching a group towards a jam. Here we're concerned with what ideas to bring in, what excitement can we create, the joy we can orient people towards. And there is the other side, the hopefully invisible task, of looking after the space, organising time, money, safety, comfort. Welcoming. The mesh of activities that fade into the background but provide the context for everyone's personal journeys. We always need something of this background, holding space, maintaining safety, but maybe not always the leading, the information. Different communities have different needs - if there are many newcomers, who get most of their contacting through turning up to jams, they need the input, to develop. Communities with a lot of experience, lots of teaching can let go of the need for this side of facilitation. But there's still the need to book space, turn on lights, extract cash. There are points where the sides of facilitation touch: opening and closing circles set tone, provide structure, maybe build community, connect outwards. I wonder which things we do are by default, and which are necessary. Yesterday I talked about naming our injuries and boundaries in opening circles. Why bother? After the fifth, tenth, twentieth person listing ailments, who remembers? Of course, part of the point of stating is to tell ourselves - "I've got a sore back, so I can't lift much weight" is for me, because as always, it's my responsibility. But sometimes stating injuries seems to create a terrible gravitational pull towards those areas, those actions. I heard a tale of making a cross of duct tape on an injured shoulder when it was essential not to use it - a constant visual reminder to the dancer and their partners. As facilitators, we have a hand in shaping the culture, the community. What do we want to encourage, what is not ok? What kind of jam do we really want to make?